Belgium is often overlooked as a country of immigration because of its size and its less known history of immigration. Yet over the last three decades Belgium has become a permanent country of settlement for many different types of migrants. Migration, asylum, and integration policies have largely been responsive in nature, reacting to circumstance, rather than pursuing a long-term vision. It is only in recent years that policymakers have started to develop new policies and legislation in a more consistent way. Public opinion, heated immigration debates, and a consistent rise of right-wing parties have no doubt played a role in this as well. The Benelux region has historically been highly mobile. In the aftermath of the two World Wars, and more intensively since the 1960s, Belgium set out to attract inflows of immigrant labor migration. Bilateral agreements were concluded with Southern European and Northern African countries as well as Turkey within a flexible work-permit regime accompanied by lenient family reunification rules. The lack of comprehensive figures has been a central challenge for Belgium in creating a consistent migration policy. Reliable and comparable data are hard to find because measurements and methodologies vary. For instance, it is hard to measure the real number of people with an immigrant background in Belgium because of high naturalization rates in the past decades. In addition, information on the nationality or birthplace of parents is not collected, which makes it difficult to ascertain the exact size of the second and third generation of immigrants. Overall, migration for family reasons is understood to represent the bulk of residence permits issued, but estimations vary between 30 and 50 percent of the total permits issued annually. Study and remunerated labor are often put roughly between 5 and 15 percent of all permits issued. Data on both categories is incomplete, as it only counts those who have formally registered – either to acquire a degree in Belgium (hereby leaving out exchange students), or for remunerated labor. Therefore, labor force data only give an indication of the active immigrant population present in Belgium, and their share of employed and unemployed persons. Migration for humanitarian reasons and refugees are often measured separately. The latest figures put their numbers at around 20 percent of the total of residence permits issued. These figures do not take into account refused asylum applicants and unauthorized migrants present on Belgian soil. All in all, it seems that for most categories actual figures might be higher in reality. By the end of the 1960s, the government had adopted a more restrictive labor migration policy, in response to the economic recession and rising unemployment at the time. In 1974, a formal cap was introduced to limit economic migration. Separately, Belgium has served as the capital of the European Union since the end of the 1950s, hosting most of its institutions. As a result, increasing numbers of EU citizens have since then settled in Belgium, both temporarily and permanently. By now, EU citizens make up more than half of the total non-national population in Belgium. After labor migration was limited, immigration to Belgium was mostly via family reunification and asylum. Since the 1990s, the number in asylum applications has steadily increased up until 2012; for the first time, applications for every month in 2012 so far have been lower than the same month in 2011. The Belgian government designed both labor migration and asylum policy in response to circumstantial economic or humanitarian needs, without a long-term vision. The first effort towards more comprehensive immigration law was only introduced in 1980. Similarly, citizenship and integration policies were shaped in a laissez-faire way for decades. Only in recent years has the government begun reforming these policies, starting with asylum and family reunification. Additionally, the government decided to bring the competences for asylum and migration policies together under the auspices of a single Asylum and Migration State Secretary. Finally, it is important to note that Belgium is a country of two linguistic and political realities. This has become increasingly conflictual over the last decade, partly demonstrated through the continuous rise of the right in Flanders. This dynamic has been largely absent in Wallonia. Migration policies seem not to have been directly affected by this tension. However, increased politicization of migration coupled with the inevitable need to consistently reform migration policy is pushing policymakers to develop more long-term policies for the future. Immigrants made up almost 18 percent of the entire population in 2010. However, people without Belgian nationality represent only 10 percent (see Table 1) of the total population because of Belgium's flexible naturalization policy which has allowed for approximately 30,000 naturalizations annually. 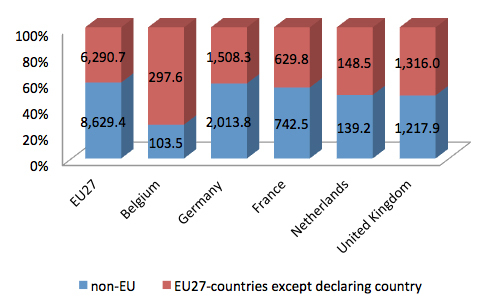 Citizens from the 27 EU Member States make up just over half of the total foreign population in Belgium, most of which are from the EU-15 (see Table 2). The immigrant population from Italy, France, and the Netherlands constitute more than 40 percent of the total immigrant population. Moroccans make up almost 8 percent and Turkish nearly 4 percent. These numbers present a somewhat skewed picture as non-EU nationals tend to naturalize more frequently than EU nationals. In 1984, the Belgian Nationality Code established the principle of jus soli and simplified the process for naturalization; for example, after continuous residence of seven years people could declare their wish to naturalize. This legislation was amended several times, most drastically in 2000 (commonly known as the accelerated naturalization law or "snel-Belg-wet") when this residence requirement for naturalization was shortened to three years (and even to two years for stateless applicants and refugees). Unlike other European countries such as the Netherlands or France, the Belgian Nationality Code has never stipulated any formal integration conditions. Since its entry into force, almost 800,000 people have acquired the Belgian nationality. Of those, the majority are third-country nationals. While more than three-quarters of Turkish and Northern African nationals acquire Belgian citizenship, this is the case for only 30 percent of the EU-27 nationals. The high proportion of naturalizations has led to a new proposal intended to tighten the existing naturalization conditions by introducing formal integration requirements including proof of economic participation and knowledge of language. It also increases the minimum residence to five years and broadens the possibilities for loss of citizenship. The proposal, which has been on the table for the last two years, has finally been approved by Parliament in October 2012 and is expected to enter into force on January 1, 2013. Since the Belgian government limited economic migration in 1974, family migration represents nearly half of the overall immigration to Belgium, followed by refugees and students. As with citizenship legislation, Belgium reformed its flexible family reunification policy in 2011. The new bill introduced stricter conditions for family reunification and a stronger legal framework to combat marriage fraud. As in the United Kingdom and the Netherlands, the sponsor must prove that he or she possesses sufficient and independent income (120 percent of minimum wage), housing, and health insurance. Only partners and minor children qualify for family reunification, and the time period for demonstrating a stable relationship has doubled from one to two years. In addition, applicants must now meet certain integration criteria. No formal evaluation or data are available, but a decrease in approval rates has been confirmed since the adoption of the new law. The legislative implications of this new law have widely been recognized as controversial, and have raised questions of validity. Student migration has been on the rise in Belgium and is expected to increase further. It makes up the second largest category after family migration, without taking into account humanitarian migration. Roughly 30,000 students (65 percent) of the total foreign student population in Belgium are from the European Union, and two-thirds from neighboring countries France and the Netherlands. Compared to the European average, Belgium receives a higher number of foreign students (see Tables 2 and 3), but receives a relatively similar proportion compared to its neighboring countries. Only the United Kingdom stands out, attracting 30 percent of the total foreign student population in Europe. The number of asylum seekers has been steadily rising in Belgium over the last three decades (see Figure 2). Asylum applications have peaked particularly throughout the 1990s and early 2000s, due in part to political instability in countries like former Yugoslavia and Iran. In peak years, Belgium received disproportionately high inflows compared to its neighboring countries (see Table 4), equal to about 11 percent of all asylum applications submitted in the European Union. Over the last decade, the main countries of origin have been Russia, Democratic Republic of Congo, Iraq, and Serbia. Asylum applications in Belgium peaked in 2009-10 following the visa liberalization in the Western Balkans. This mostly concerned Roma minorities from Southern Serbia and from Macedonia whose applications were ineligible due to visa-free travel to the European Union. Belgium, together with other receiving countries such as Germany, requested to speed up negotiations on the proposal introducing a safety mechanism to the existing EU Visa Code Regulation for the temporary suspension of visa-free travel in case of an emergency situation. The Belgian government responded more concretely with dissuasion campaigns in the region and with the creation of a list of safe countries – to which Albania, Bosnia-Herzegovina, Former Yugoslav Republic of Macedonia (FYROM), Kosovo, Serbia, Montenegro, and India have been added – to improve and speed up asylum application procedures. For the first time, overall asylum applications for every month in 2012 so far have been lower than the same month in 2011. Note: The data from 2007 onwards measures individual asylum applicants as opposed to applications. The Belgian government has struggled to ensure sufficient capacity for receiving asylum seekers, particularly over the past decade. Before the 2007 Reception Law, no material support framework existed for asylum applicants beyond the admissibility phase of their asylum procedure. To respond to the increasing reception needs, the government has attempted to address this issue by providing more human and financial resources to structurally expand reception places and improve the process and follow-up of asylum procedures. Similarly, policymakers have been struggling to respond to the growing issue of unauthorized migrants over the last two decades. There is no comprehensive data, but estimates put the numbers between 40,000 and 140,000 in 2007. Belgium has attempted to address this with a longstanding voluntary return policy in cooperation with the International Organization for Migration, bilateral readmission agreements, and scattered regularization programs, though a comprehensive approach is lacking. In 2009, new regularization (and integration) criteria were introduced, but the subsequent regularization campaign in 2009 has been received with mixed feelings by both supporters and opponents. Despite the government's intention to drastically respond to irregular migration, the new regularization criteria and campaign were very much a piecemeal approach to an issue which requires a comprehensive answer, not just legislatively but also structurally and financially. The number of work permits issued by the Belgian government has decreased over time. Only 12 percent of all long-term permits issued in 2011 were for remunerated labor. This can be explained by two factors. Firstly, the Belgian government cancelled the bilateral work agreements and subsequent work permits in the 1970s. After this, work permits were limited to more highly skilled immigrant workers. Secondly, Belgium receives increasing numbers of EU free movement workers, who live and work in Belgium but do not require work or residence permits under the European free movement legislation. As a result, it is difficult to paint a complete picture of the total number of non-Belgian workers. Overall, Belgium scores very low on labor market integration of third-country nationals compared to other European countries. There is a stark difference between the labor market integration of EU and non-EU nationals. According to 2011 Eurostat labor force data, less than 40 percent of the non-EU population in Belgium is employed as opposed to more than 60 percent of EU nationals – the lowest average of all its neighboring countries, and contrasting with an average of more than 50 percent employed third-country nationals in EU-27. Particularly non-EU women have very low employment rates: just over 25 percent are employed compared to an average of 45 percent employment rate of non-EU women across the EU-27. Additionally, non-EU immigrants in Belgium were hit harder by the economic crisis and unemployment in recent years than the native population, though EU citizens coming from Southern and Eastern Europe were also affected. One possible explanation for such low scores is that these numbers only represent those third-country nationals who have registered as either employed or unemployed. This also brings up the issue of Belgium's fairly large shadow economy and of potential economic activity that goes unregistered. Another reason why so few third-country nationals are employed may be Belgium's comparatively attractive unemployment benefits. For a long time, integration policies in Belgium were designed in an equally laissez-faire and ad hoc approach as the other migration and asylum policies. The Belgian government introduced integration as a policy concept as part of general migration legislation in the late 1980s, but without any formal or coercive requirements. Integration and reception became a competence of the communities, to which other policies regarding social inclusion were added, such as housing, urban planning and education. In the 1990s, the Center for Equal Opportunities and Opposition to Racism was established, responsible for the promotion of equality of opportunity and to combat all forms of discrimination and exclusion. Integration Decrees were introduced in both communities in the mid-1990s. The integration policy in Wallonia has historically always been focused on social inclusion in general, while the Flemish approach has shifted from a minority policy in the 1990s and 2000s (similar to the Dutch example) to an overall inclusive policy regardless of origins in 2009. In both communities, integration supporting frameworks for language, access to the labor market and housing already exist, but both communities are considering defining their policies more extensively in the future. At the regional level, cities have been steadily adapting to the increasingly multicultural environment regarding newcomer initiatives, language learning, etc. The 2012 regional elections are a testimony of the changing Belgian demography: almost all electoral lists had representatives from a migrant or minority background. Research has shown that migrants in Belgium identify themselves with their city and local environment more so than with the country of Belgium or a linguistic community. Even if a more right-wing wind might blow at the community level in Flanders, cities in both communities are likely to continue structurally approaching the social inclusion of their urban areas as a whole, regardless of the possible introduction of obligatory integration measurements. What makes overall migration and integration all the more complex in Belgium is its dual linguistic and political system. Historically, public opinion in Flanders has been much more (center-) right, while the public opinion in Wallonia has always been much more (center-) left. This has been reflected in the power balance between parties in the federal government. Recently, however, the political composition of the regional governments no longer corresponds with the composition of the federal government, as the Flemish government has shifted much more toward the right. This is likely to put the Belgian federal system under increasing pressure in the years to come. In Flanders, public opinion has fueled a steady rise of the far right party Vlaams Belang (Flemish Interest) in the last three decades. Nevertheless, both the Flemish and federal governments have been able to avoid Vlaams Belang from entering into both regional and national government – despite its electoral victories of up to a third of all votes – because of a consistent cordon sanitair, an agreement between all parties never to enter into government with Vlaams Belang at local, regional or federal level. Over the last decade, the non-xenophobic, right-wing, separatist party, N-VA (New Flemish Alliance), has increasingly acquired ground on the political scene at the expense of Vlaams Belang. Overall, the migration-integration-Islam debate has been much more polemic and heated in Flanders than in Wallonia. If N-VA continues to gain influence in the future, they are expected to push for a more acceptable right-wing reform of migration policy. However, it is debatable whether the consistent rise of right-wing parties has had a direct effect on the recent legislative reforms regarding family reunification and citizenship. Firstly, these are federal competencies for which agreement from all communities – Belgium's linguistically-based political entities – is needed. Secondly, the reality of Belgian society today has pushed policymakers for more consistent reforms in migration and asylum policy, decided by the federal government, of which N-VA is not a part (yet). As a result, the current and future governments are likely to continue evaluating and reforming migration legislation in Belgium, not because of shifts in political party politics, but because of the concrete needs of a diverse and sustainable welfare society. The evolution of migration, asylum, and integration policies in Belgium has shown that there is a clear need to think about these policies more holistically, comprehensively, and proactively at the federal, regional, and local levels – and several steps have already been taken in that direction. At the federal legislative level, important reforms have been passed (or are about to) regarding family reunification, asylum, and citizenship. Both the Flemish and French-speaking communities have reformed integration and social inclusion policies in the last decade, though this area remains a work in progress. Apart from newcomer integration frameworks, both communities are increasingly aware of the need for mainstream inclusive policies such as for education. The French-speaking community has passed a major education reform in 2006, postponing the beginning of secondary education (and the accompanying selection) to the age of 14 instead of 12, thereby extending general basic education for everyone. The Flemish community has been debating and attempting to implement such as reform since 2009, but this has been met with much resistance, especially from the center-right. In the two biggest cities, demographic data is proof of the permanent diverse nature of Belgium: in Antwerp, nearly 38 percent of its population is of foreign origin, while approximately 18 percent have a foreign nationality; in Brussels, nearly 62 percent is of foreign origin and approximately 31 percent have a foreign nationality. The Brussels-Capital Region is of course extremely diverse not just because of general immigration, but also due to the vast community of European nationals working for the European institutions. The ratio of net migration is expected to stabilize over the next decades and even slightly decrease. Nevertheless, Belgium will need to accommodate the present and future permanent diverse character of its population, not in the least by improving both opportunities and outcomes in the education system and in the labor market of its entire population. Aantal asielaanvragen blijft dalen. 2012. De Redactie. September 28, 2012. Available online. Belgian Federal Justice Department. 1980. Law on access to the territory, residence, settlement and expulsion of foreigners. Available online. Belgian Federal Justice Department. August 8, 1983. Law establishing a national registry of natural persons. Available online. Belgian Federal Justice Department. June 28, 1984. Code of Belgian Nationality. Available online. Belgian Federal Justice Department. 2000. Circular on the Law of 1 March 2000 amending certain provisions relating to the Belgian nationality. April 25, 2000. Available online. Belgian Immigration Office. 2009. België stimuleert terugkeer van illegale vreemdelingen. Available online. Belgian Chamber of Representatives, Plenary Session. April 28, 2011. Available online. Centrum voor gelijkheid van kansen en voor racismebestrijding. 2011. Migratie Jaarverslag 2010. Available online. Centrum voor gelijkheid van kansen en voor racismebestrijding. 2012. Migratie Jaarverslag 2011. Available online. Council of the European Union. 2012. Press Release 3195th Council meeting Justice and Home Affairs. October 25-26, 2012. Available online. EMN Belgium. 2012. Lijst veilige herkomstlanden goedgekeurd door ministerraad. March 23, 2012. Available online. European Commission. 2011. Proposal for a Regulation of the European Parliament and of the Council amending Council Regulation (EC) No 539/2001 listing the third countries whose nationals must be in possession of visas when crossing the external borders and those whose nationals are exempt from that requirement. May 24, 2011. Available online. 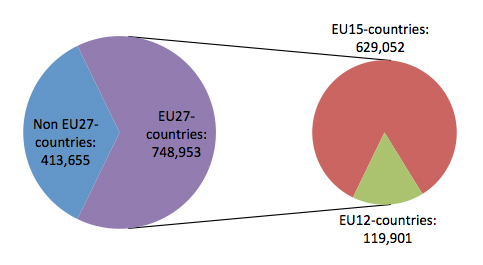 European Statistical System (Eurostat). 2012. Belgium. Available online. Ghijs, Inge. 2009. Marokkanen en Turken voelen zich nauwelijks Vlaming. De Standaard. November 23, 2009. Available online. Hanseeuw, Laurent. 2012. Belgie, Immigratienatie: Statitieken en Evoluties. Itinera 9. May 15, 2012. Available online. Kruispunt Migratie-Integratie. 2011. Nieuwsbrief Vreemdelingenrecht en Internationaal Privaatrecht. September 22, 2011. Available online. Milica Petrovic was an Associate Policy Analyst at MPI Europe, where she worked on immigrant integration policy.